Make way for the anonymous sources bearing gifts. 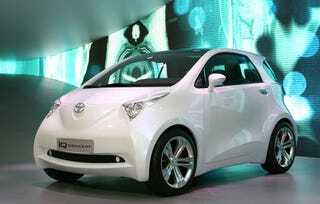 Automotive News reports Toyota will power its IQ microcar with an engine from Yamaha. That from unnamed company executives. Toyota's not volunteering any information on the powertrain selected for a production version of the minicar concept, which showed up in Frankfurt sans engine. The sources say Yamaha Motor, may build the engine for Toyota. Though we'd imagine they could just slap in the 1.2-liter four from the V-Max and start a minicar horsepower war. If only.